Rare, old hand painted Bollywood movie poster of the 1970 hit crime thriller, Jeevan Mrityu for sale. This is an actual surviving vintage publicity poster of the 1970 Hindi film that featured Dharmendra in the lead role. Jeevan Mrityu marked the Bollywood debut of Hindi film actress Raakhee. The film is also considered by many as Dharmendra’s finest acting performance ever in Indian cinema, making this poster highly collectible. 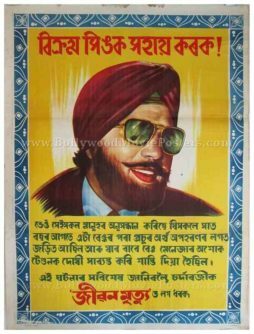 Printed and circulated a few years after the first release of the film (somewhere in the late 1970s), this old Bollywood poster was printed for publicity of the film in Kolkata but never ended up being used. This quirky hand painted Bollywood poster features a stunning portrait of actor Dharmendra wearing aviator sunglasses and a turban. Lettering used in the poster is entirely in Bengali and this is one of the odd few movie posters designed in Bollywood in which nearly half the space is consumed by text instead of visual imagery. 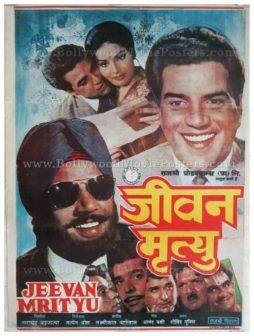 Jeevan Mrityu is a 1970 Bollywood crime thriller starring Dharmendra, Raakhee and Ajit in lead roles. The film was a remake of a Bengali film with the same name starring Uttam Kumar and Supriya Devi in lead roles, and went on to become a hit at the box office. Songs from the film, particularly ‘Jhilmil Sitaron ka Aangan hoga’ sung by Mohd. Rafi & Lata Mangeshkar became a rage throughout the nation. 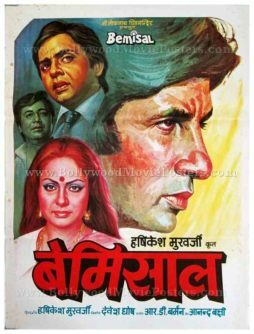 Old Bollywood movie poster of the 1970 hit crime thriller, Jeevan Mrityu for sale. Jeevan Mrityu marked the Bollywood debut of Hindi film actress Raakhee. 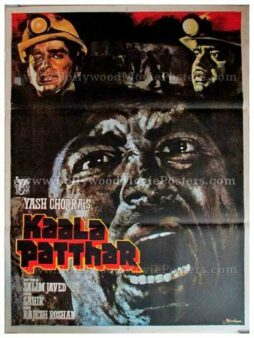 The film is also considered by many as Dharmendra's finest acting performance ever in Indian cinema, making this poster highly collectible. 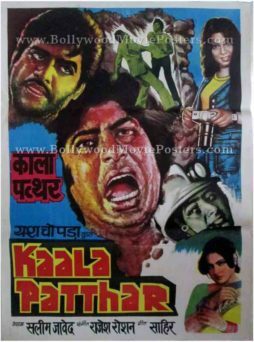 This old Bollywood poster was originally designed by cutting out images of actors from separate still photographs (shot on set location) and pasting them on a board. The background and typography are hand drawn / hand painted, which makes this vintage movie poster an interesting mix of two very different design techniques. Songs from the film , particularly 'Jhilmil Sitaron ka Aangan hoga' sung by Mohd. Rafi & Lata Mangeshkar became a rage throughout the nation.